… but please watch your step! This image was captured during my 2-day photo outings to the Venice Rookery, in Venice, Florida. 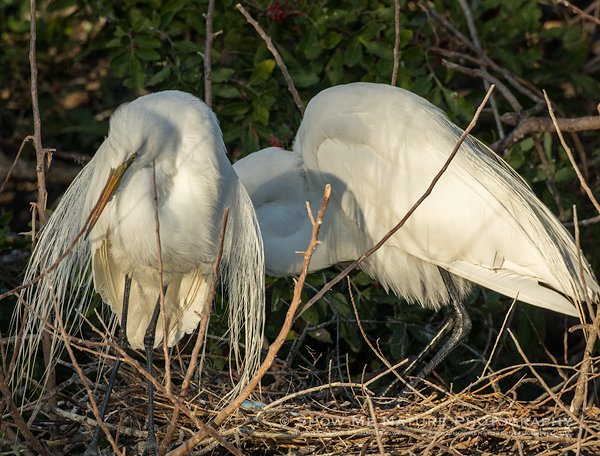 Most of the Great Egrets were busy building nests (will be covered in another post) and a couple of pair even mating. But this was the only nest that was busy with parents incubating eggs. An Audubon volunteer was nearby and I overheard him telling another photographer that this was the first known egret nest with eggs, so far this young spring, and they had seen three eggs, which confirms what I thought I saw. Tags: bird photography, birding, birds, birdwatching, Blog, Florida, great egret, nature, nature photography, photography, travel, Venice Rookery, winter.